They come in a ridiculous nice box. It's plain matte black with a shiny Illamasqua logo for contrast. 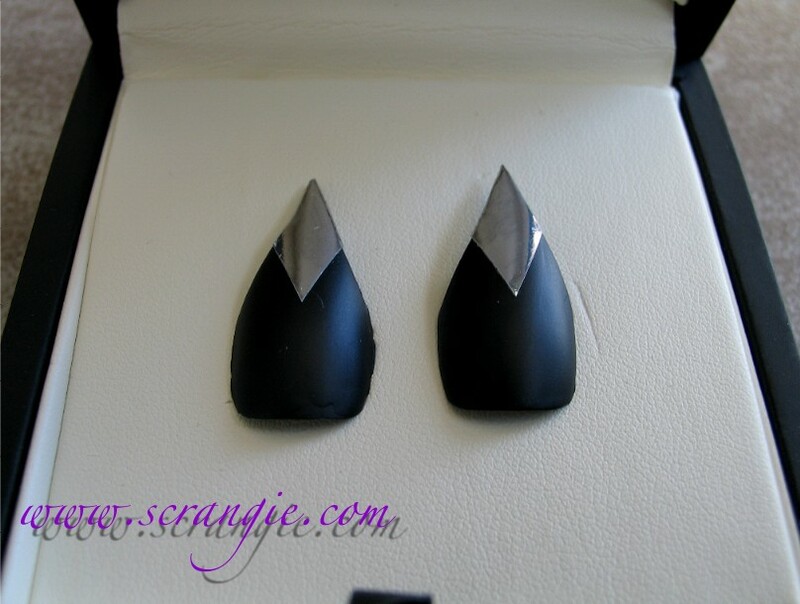 It has a really sturdy suede-ish fabric lined sleeve that protects the matte black jewelry box containing the Quills. I know it's just packaging, but man, it's so fancy and expensive feeling! The inner box. It looks really light and grey here because of the lighting, but look how it picked up on the texture of the box. That's weird and kinda cool, I don't know how I managed that. The box feels like it's a smooth satin fabric but it also looks like cardboard... not sure which it actually is, but it's pretty. When you pull up the little ribbon, this chamber is revealed. It holds the application instructions, a little tube of nail glue and four stick-on tabs. I love the design of this box. Secret storage for the less-glamorous items! There's a little sticky tab underneath each quill. Probably not the most permanent solution for holding the quills, but you can always store them under the flap if the tabs lose their stickiness. Also note the construction of the quills from the underside. The rough black part feels like acrylic sealing in the edges of the chrome foil material. The bottom part is a smooth plastic like a nail tip or press-on nail (which is what these are). Each set of quills is handmade and unique and have their own little quirks and imperfections. Now, these are slightly too big for my thumbs so they look a little 'off', but I just had to try them on. You might be able to file down the edges/sidewalls if they're too big, but I was afraid to... Didn't want to accidentally ruin them. I used the sticky tab with no glue. So wicked looking. They're quite long and rather pointy so do take care when wearing these. They're a little flexible so that you don't do any major damage, but you could still poke yourself if you're not careful! Application is extremely easy. For this very temporary application, I used only the adhesive tab. If you've never applied an adhesive tab, this is all you do: Prep the nail by wiping it with alcohol or acetone, peel the tab off of the paper sheet but leave the paper backing on. 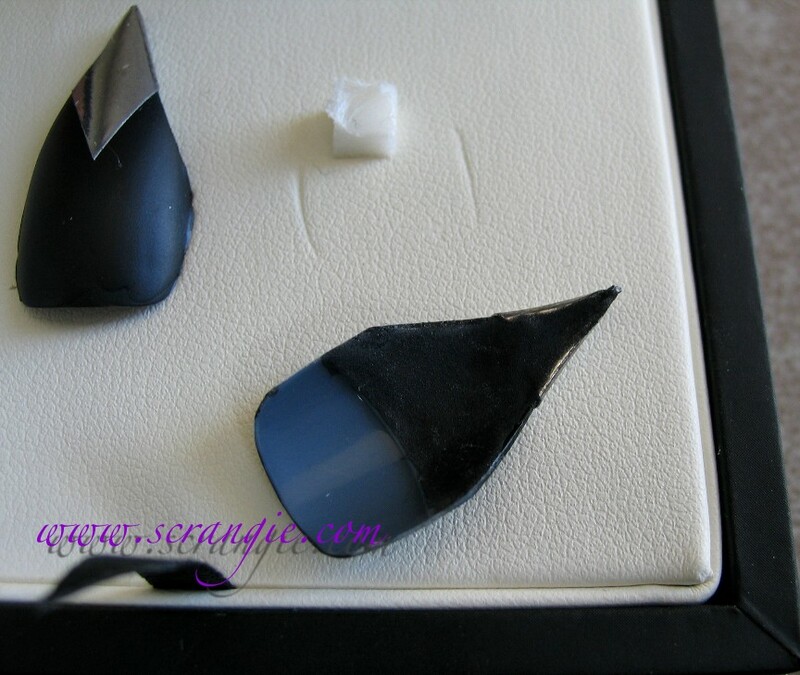 Place the sticky side of the tab onto your nail and smooth it down so that it lays flat with no wrinkles. Peel off the paper backing and press the nail quill onto the sticky part. Voila! Easy. But, keep in mind that adhesive tabs are not very strong and won't really last more than an evening. The instructions recommend combining the tabs with the glue for a longer wear and to preserve the life of the Quills. It instructs you to apply the tabs like normal, but then apply a few drops of glue on the tabs before you apply the Quills. This is so you can remove the Quills without ruining them by soaking them off like you'd have to do if you use the glue alone. To remove them when applied with tabs, you run your thumbs under warm water and just peel them off. It doesn't damage your nail at all because it's just sticky tape. 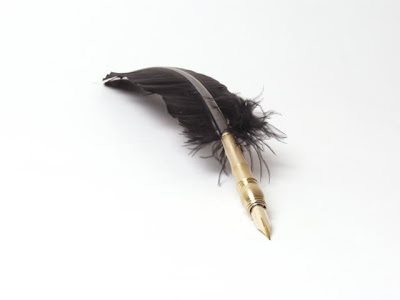 For removal with glue plus tabs, you can do the same thing but you may need to clean the underside of the quill because there will be a little sticky residue left from the tabs. Easy to apply, easy to remove. Looks awesome and will definitely make you stand out. The only downside I can think of is the price- they're £35, which is about $55 USD. They are quite limited and all handmade, a true collector's item, so they'd have to be a little on the pricey side, but I do think that £35 is quite steep. The info about them says that they're bespoke- which, as I understand it, implies custom made to your specifications, but I'm not entirely sure if/how that works with these. If they are all custom fit, that would definitely justify the price. So, now you have pointy matte black and chrome thumbs, what do you do with the rest of your nails? That's simple- Scorn nail polish. It's designed to compliment the quills- it has the same color and finish. This is two coats of Scorn. It has amazing coverage and smooth, even formula. The finish isn't really a true matte- it has some shine to it. You know I'm all about the super chalky matte-mattes, so this isn't exactly my favorite finish, but it does match the Quills. It looks like leather to me, so that's cool. If you wanted to continue the matte black and chrome theme, you could put a little silver gem or stripe of foil nail art tape on each nail, too. I think these are really crazy and I love them! They're a weird combination of beautiful/glamorous and intimidating/tough. They're delicate but at the same time they're knife-like dangerous! 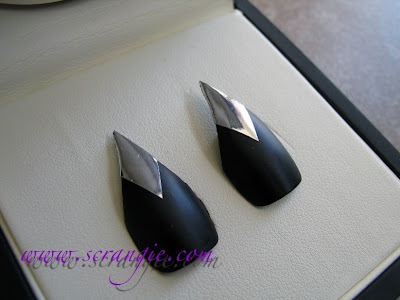 I was expecting a true stiletto shape, but they actually are quill-shaped, which also impresses me. If you want this look but can't afford the price tag, you could always go to a salon to get your thumbs done in black and silver acrylic stilettos, but they won't be quite the same and they won't be re-usable. This would be a good gift for a nail fanatic who loves to be different and stand out. 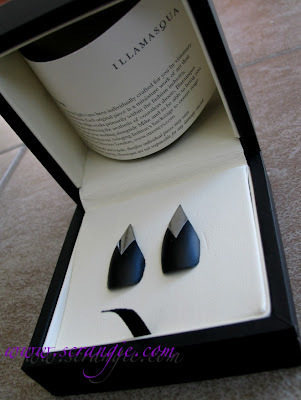 The box and packaging and presentation makes them very gift-able. Available only on Illamasqua.com and at the flagship store on Beak Street in London. I don't quite see the point of these, I don't know where I would ever wear something like those quills so I doubt I'll buy them. But hey, at least they are doing something different I can appreciate that! These would have been amazing around Halloween! Originally, I thought they were slip on, like jewelry, like a ring to wear above the knuckle on your thumb. I would consider them if that were the case, but to actually apply them with glue? I'll just admire them from afar. They really are stunning though, for however impractical, and I love Scorn! The boxes remind me of the boxes Louis Vuitton polishes come in, but even more elegant. These are so cool but I could deffinitly see myself poking my self in the eye with one of those. So cool! Wish I could pull those off! I ... don't get it. They ARE different, that's for sure. I love them but they are £35!!! And that is just ridiculous. These are wicked cool! I would wear those anywhere. I'd probably have lots of little gashes but I'd be cool. Not cool, wicked cool like you! Illamasqua Scorn is very similar in finish to Chanel Black Velvet, Could they be a dupe? I love the look of the Chanel but it has to be applied super carefully or you get bubbles, this gives the same look but sounds easier to apply. 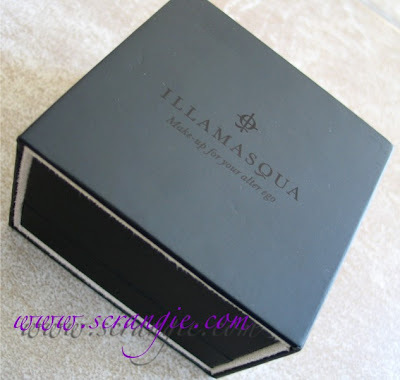 I think this may become my first Illamasqua! Wow these are the weirdest nail accesories I have ever seen. Unique non the less but strange. All I can pucture is poking an eye out lol. I'm loving "Scorn" though , the finish is so amazing! I love the polish but dont know how I feel about the quills! As it looks like every other polish company will be going down Crackle Avenue this upcoming season, I can appreciate Illamasqua for doing something different. No way could I get away with these, as I would probably injure myself in the process (no joke), but again, they get major kudoes for being away from the trends. Plus, the finish of Scorn is amazing. Since the polish matches, it would be nice if they had the polish and quills in a set. It would also make the price easier to swallow. For some reason, the word "quills" made me think of the movie with Geoffrey Rush and Kate Winslet. mmm I like those pointy things! really cool. 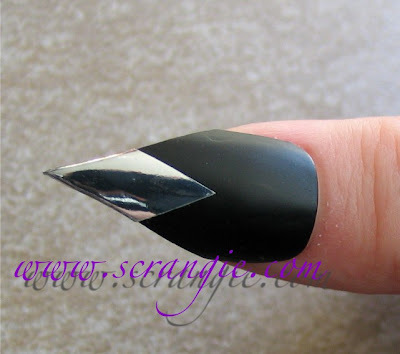 And I must have that black matte polish - UGH you make me want so many things Scrangie! ah-mazingggg is all I can say! not loving these at all. Very tacky and not elegant at all. oh my god, this is the most beautiful black nail polish i've ever seen. love it!!! These are awesome, tacky, but I love it. I don't, however, enjoy the price tag. ok am I the only one who does not understand the purpose of these AT ALL?? they don't look good and they'd be very problematic so... why? Are you supposed to be able to write with them? Like, dip your finger in ink and use it as a quill? have you by any chance tried LA Girl's Matte Black? If so, I am wondering if it would be a good dupe for scorn?